SB900 Violations and How to Fight Back! California has some of the best foreclosure laws in the country, designed to protect borrowers from illegal foreclosure practices. The Home Owner Bill of Rights [SB900] makes it illegal for lenders to foreclose on a home owner without first contacting the struggling borrower to offer alternatives to foreclosure. In California, if a lender does not comply with the very strong SB900 requirements, the borrower can sue the lender to stop foreclosure. Dual tracking – This type of fraud is related toforeclosure in which the lenders proceed foreclosure while offering to loan modification. Negligence – This happens when the lenders tell that the homeowners’s modification documents is lost or they never received it. Other form of this fraud is the lenders tell that the borrower is qualified for a modifictaion but then they want the borrower to apply again. Estoppel – This one may be the annoying type of mortgage fraud because after the long wait, the lenders tell that the modification documents is denied. Inserting unconscionable waivers – Mortgage servicers may try to insert waivers into loan modifications where homeowners agree to release the legal claims. When mortgage fraud happens, the first thing to do is contact an experienced mortgage attorney. When homeowners do not take action, they may end up in foreclosure or, worst case scenario, they may miss the chance to pursue other alternatives to stop foreclosure. Homeowners that know they are the victim of mortgage fraud should call our mortgage lawyers to help resolve the matter. 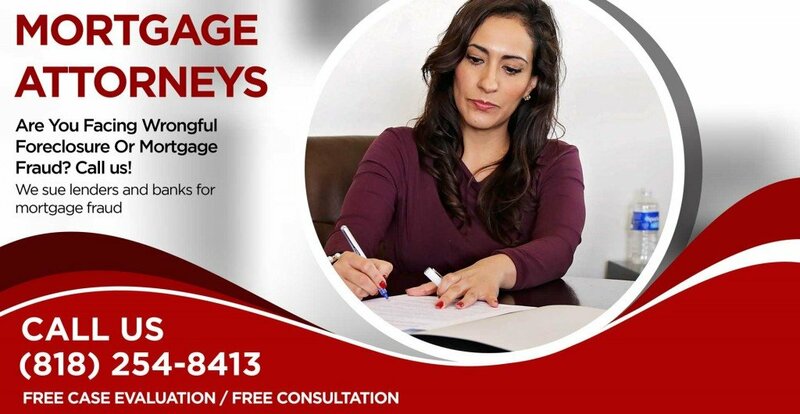 During the free consultation, our experienced mortgage attorney will ask about homeowners’ financial condition such as loan terms and irregularities in the loan service. Mortgage lawyers at our law firm will evaluate your title, loan history, and mortgage payments to determine if there is any miscalculation of mortgage payments. The dedicated team of mortgage attorneys at our firm will identify violations such as accounting errors, modification process delays, and SB900 violations, such as proceeding with foreclosure while a borrower is under modification review. After our experienced mortgage lawyer evaluate your case and identify violations, we will file a lawsuit against the lender. Our mortgage attorneys will aggressively move to resolve the matter in the best interest of homeowners and stop foreclosure while the lawsuit is pending. If you believe that your lender is violating your rights, it is best to contact our mortgage attorneys for immediate help, (818) 254-8413.